A few weeks ago my husband and I had a few days off work and on one of the days we decided to have a walk around the lanes in Brighton with our dog. I needed to pop to one of our local shops, Zoing Image in Sydney Street as I was after some Cinestill 800 film to practice some night time shots using my Pentax K1000 (blog to follow on this). As well as the unusual film selection that Zoing Image stock, they also sell a selection of second hand cameras. Every time I visit, there are always a new selection of secondhand cameras to choose from so I love to browse. 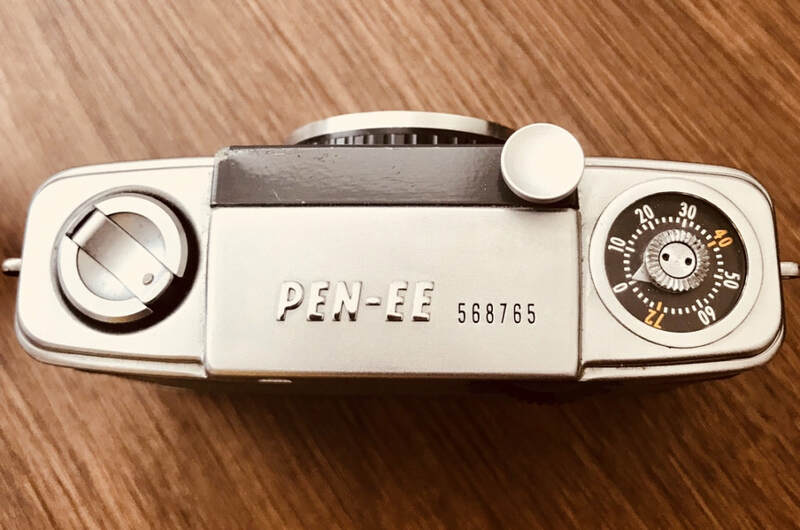 Whilst my husband isn’t really into photography, he always takes a keen interest in any camera I buy and was extremely fascinated by my Olympus Pen FT half frame camera and the quality of images it produces. I think this is what led him to noticing the Olympus Pen EE Camera in the cabinet for sale. He told me he was instantly drawn to the size and grey colour of the camera. Once I explained to him it was an automatic half frame camera he wanted to have a look at it in more detail. He absolutely loved the tiny viewfinder window and the feel of it in his hands so we bought it along with some Kodak Colour Plus 200 35mm film and loaded it in the shop there and then so we could take some photos of our day around Brighton. In some ways, this camera is similar to the Olympus Trip where a red flasher will pop up in the viewfinder if the image is too bright or dull and won’t expose correctly. This took some getting use to for my husband as he tried to take several shots where this happened. The film number counts back from 72 to 0. The lens is a D Zuiko f/3.5 (4 element) with a focal length of 28mm. I already knew the lens would be of good quality from my experience of using Zuiko lenses on my Olympus Pen FT.